My son discovered his feet a couple of weeks ago. Naturally, he has not stopped playing with them since. Have you ever looked in to a baby’s eyes the moment they discover something new? There is a spark, a light, in their eyes that was not there before. You can almost see them learning. If you have not experienced this, I hope that one day you are able to. I have been lucky enough to see those exact moments twice now. The first time he realized he had hands and the second, his feet. You know that feeling you get when you come to a realization? It just washes over you. 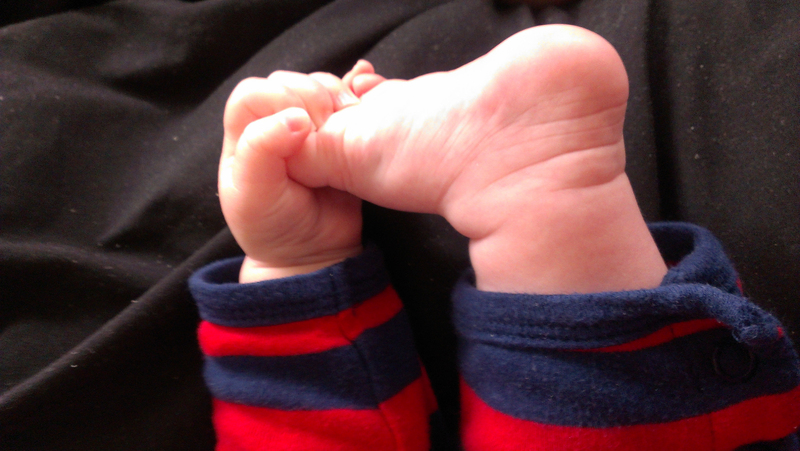 I imagine that is how babies feel when they figure out that those funny little wiggly toes belong to them. It is so simple, so natural, and so perfect. I am not sure what will come next. I imagine getting up on his hands and knees since he already rolls all over the place and scoot around on his stomach. The days go by so fast, although they can seem so long. I admire him often, it has been rewarding and enlightening to watch him grow every day. I try to take it all in and adapt some of that lost child like magic in my life- like, when ten little fingers meet ten little toes and there is nothing more needed in the world.